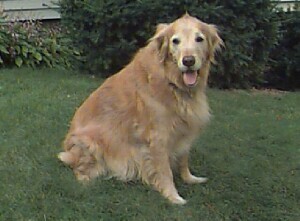 After Colleen died, we were without dogs for a few years. Eventually, we started looking into Golden Retrievers. A breader turned us on to the Yankee Golden Retriever Rescue. Through them we adopted Cider Anne, YGRR #267. Cider Anne's father was a famous model (Belleville Zachary Taylor, CD). We would see his face gracing boxes of dog biscuits. When we showed her the boxes, she didn't seem to care much about what was on the outside, only the inside. So much for the "blood is thicker..." thing. Cider Anne was a very sweet dog, who was good at obedience and loved running. She lived with us for almost twelve years.